The Liverpool branch of the Industrial Workers of the World union massively welcomes today’s announcement of the Hillsborough inquest verdict. 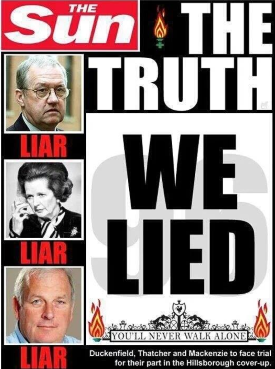 Finally, ‘The Truth’ that working class people of Liverpool and all around the world have known for 27 years has been officially recognised – ultimately, the South Yorkshire Police killed 96 Liverpool football fans. For many of us growing up, living and working in Liverpool and surrounding areas, the Hillsborough Disaster and the events that happened in its aftermath were of massive personal significance. Almost everyone on Merseyside knew someone who had been there. Many of those who were fortunate enough to come home physically unharmed still bear the psychological wounds to this day, and hopefully this verdict will give them some peace. But if we may say so, today is as much about the final victory of working class people over the political establishment’s attempts to cover up the crimes of their armed wing – the police force. Crimes that took place in plain view of millions of people who saw the events unfold on television. But within minutes, the police, the Thatcher government, and the media were working together to shift the blame. They tried to shift it from their protectors in police uniforms – some of whom a few years earlier had been battering miners standing up for their livelihoods – and onto the backs of people from Liverpool – a city whose working class had given Thatcher many sleepless nights. They tried to change ‘The Truth’ before our eyes. They tried to play on the worst anti-Scouse stereotypes (ultimately anti-poorest elements of working class stereotypes), to make us all out to be somehow less than human. But ‘The Truth’ is that in times of stress and chaos, working class people band together in solidarity. And that is a truth that the rich – then as now – fear more than anything else.